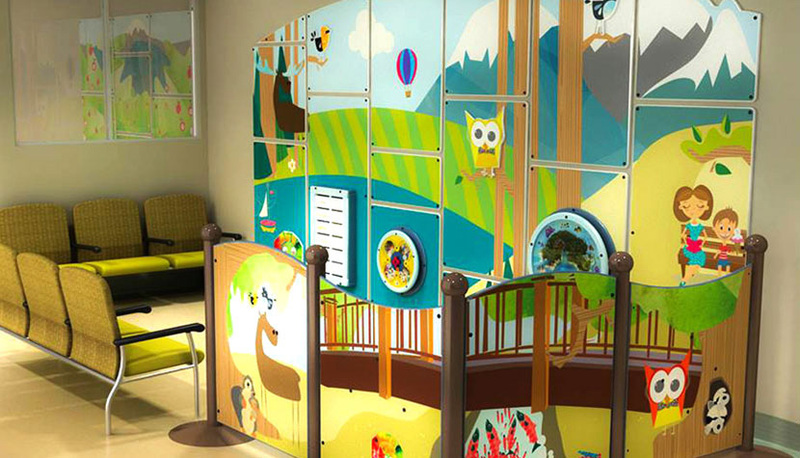 The Summerland Health-Care Auxiliary has donated $50,000 for an enhanced pediatrics waiting/play area (similar to the one in photo) in the new tower at Penticton Regional Hospital. The Summerland Health-Care Auxiliary wants to give children a bit more “play” room at Penticton Regional Hospital. The Health-Care Auxiliary has donated $50,000 towards an enhanced pediatrics waiting/play area in the new PRH tower. This is in addition to the five-year $1-million pledge they made in 2015 to the South Okanagan Similkameen (SOS) Medical Foundation’s PRH medical equipment campaign ($600,000 has already been paid). The waiting area will be located next to the Outpatient pediatric treatment area on the ground floor of the new tower. Auxiliary President Gloria Flaman said the play area will include a decorative mural, play stations and comfortable furnishings. “It’s somewhere that’s both comfy for moms and dads and fun for kids who may be in for an appointment,” added Berit Hack, the auxiliary’s Treasurer. Funding for the pediatrics donation comes from the Summerland Auxiliary’s popular Thrift Store on Victoria Road. The Thrift Store is open Tuesday through Saturday from 1-4 p.m., but volunteers come in as early as 6 a.m. to help sort through the donated goods and get them store-ready. For more information on volunteering, call 250-494-0616 or 250-486-6858. Carey Bornn, Executive Director of the SOS Medical Foundation, lauded the Summerland Auxiliary for continuing to come through for PRH. The new David E. Kampe Tower at PRH will be ready for patients in April 2019. Work will then begin on Phase 2 of the $312-million expansion, including a major upgrade to the Emergency Department.